A large percentage of women experience hormonal fluctuations that can dramatically affect their everyday lives and relationships with friends, partners and children. As women, we need to maintain a delicate hormonal balance to ensure good health and a feeling of wellbeing. When the two major female hormones, oestrogen and progesterone, become imbalanced a whole range of symptoms can present themselves. Hormonal imbalance can result in: mood swings, anxiety, stress, weepiness, uncontrolled anger, irritability, emotional outbursts, sugar cravings, lack of energy, sleep issues and loss of personal identity. These symptoms are often put down to working too hard, children or relationship trouble, when these issues can in fact correlate to abnormal hormonal balances or oestrogen dominance. 30 PLUS NuWoman combines the internationally studied and proven effectiveness of Cimicifuga racemosa with natural amino acids, vitamins and minerals to assist natural hormone balance. 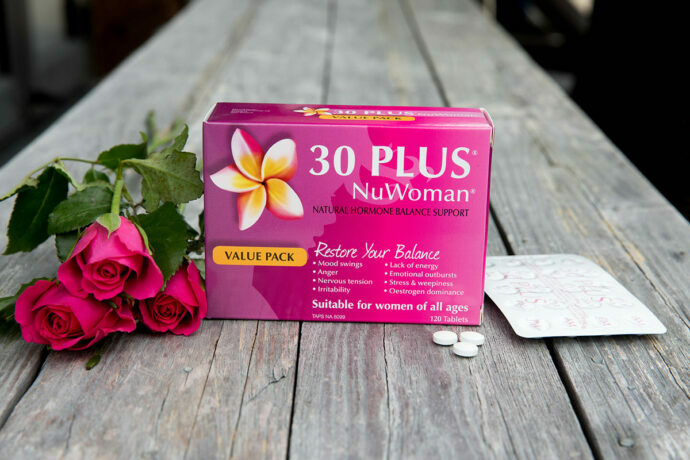 30 PLUS NuWoman is made with a natural herbal extract Cimi-MaxTM, that helps with receptors that “read and respond” to variations in the balance of oestrogen and progesterone. It also contains other vitamins and minerals that are effective at supporting hormone imbalance. L–Tyrosine– assists in regulating adrenal and thyroid function as well as improving moods. Can lead to increased energy, weight loss and reduced anxiety*. Chromium– Balances blood sugar levels which increases energy levels and reduces food cravings*. Cimi-MaxTM–has been used as a hormonal controlling agent in 30 PLUS NuWoman due to its proven affect upon the hormonal system. Vitamin B6, B9, B12– Increases oestrogen clearance via the liver. This helps reduce oestrogen dominance and supports hormonal balance. 30 PLUS NuWoman should be taken for a minimum of two menstrual cycles before assessing its effectiveness. We advise that if you suffer from any liver problems you should seek the advice of your healthcare professional before taking 30 PLUS NuWoman. On rare occasions gastro-intestinal upset or hypersensitivity (rash or irritation) may be experienced. We recommend as a good healthcare practice to not take 30 PLUS NuWoman while pregnant or breast feeding. It is always advisable to let your healthcare professional know when you are considering taking a dietary supplement. Use only as directed and consult your healthcare professional if symptoms persist. Dietary supplements are not a replacement for a balanced diet. Free from dairy, lactose, gluten, starch, yeast and artificial colouring. Suitable for vegans.